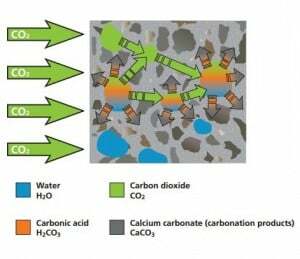 Carbonation is the formation of calcium carbonate (CaCO3) by a chemical reaction in the concrete. The creation of calcium carbonate requires three equally important substances: carbon dioxide (CO2), calcium phases (Ca), and water (H2O). Carbon dioxide (CO2) is present in the surrounding air, calcium phases, mainly Ca(OH)2 and CSH, are present in the concrete, and water (H2O) is present in the pores of the concrete. 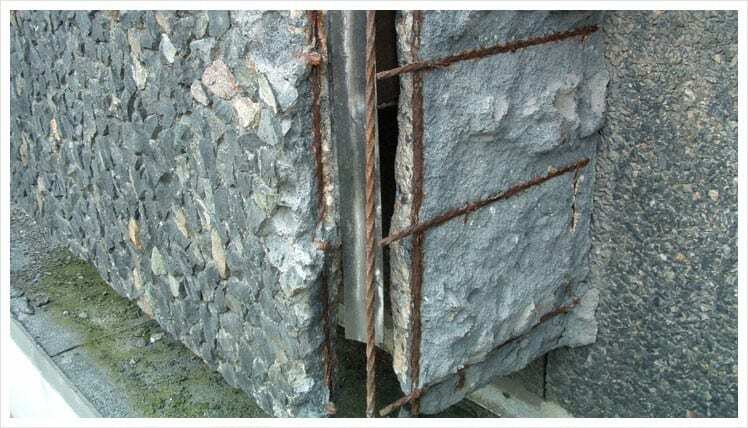 The mode of structural failure termed carbonation is a natural process which occurs in concrete. 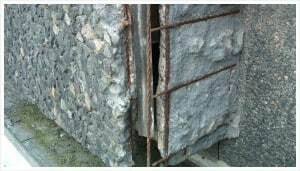 The main concern for carbonation is in the application of reinforced concrete. It starts as soon as the concrete is exposed to air. Carbon dioxide begins to penetrate the surface and react with calcium hydroxide within the concrete to form calcium carbonate. The carbon dioxide and the moisture from pores also produce a dilute carbolic acid which reduces the alkalinity of the concrete (the alkalinity of concrete is usually high, e.g. a pH of 12 to 13). The carbonation may advance 1mm to 5mm per year depending on the concrete’s porosity and permeability. The initial consequence is the hardening and strengthening of the concrete. However, the alkalinity of the concrete continues to decrease and the carbon dioxide invades deeper. Soon the carbon dioxide reaches the passivating layer and begins to break it (the passivating layer is the protective layer surrounding the reinforcing steel as a result of the concrete’s alkalinity). Once the passivating layer is broken, the reinforcing steel is exposed to the effects of air and water. The steel then begins to rust and expand putting pressure on the concrete and causing cracks and spalls. 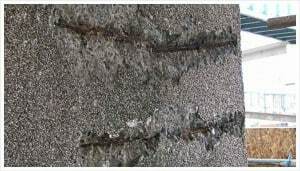 Once carbonation has begun to affect the steel, the chance of failure in the reinforced concrete member rises dramatically. Increasing the density and, therefore, decreasing the porosity and permeability of the concrete will reduce and delay the effects of carbonation. Another effective way of preventing carbonation is to use commercial chemicals such as Flexcrete’s Cementitious Coating 851 . “Flexcrete offers a range of cementitious anti-carbonation coatings that have been proven to prevent the ingress of carbon dioxide given the equivalent of a minimum additional 80mm of cover to prevent carbonation in concrete. ” These products not only prevent carbonation, but they can actually reverse the process if coated over concrete already attacked by carbonation.